The Engineir and I do love our toys. 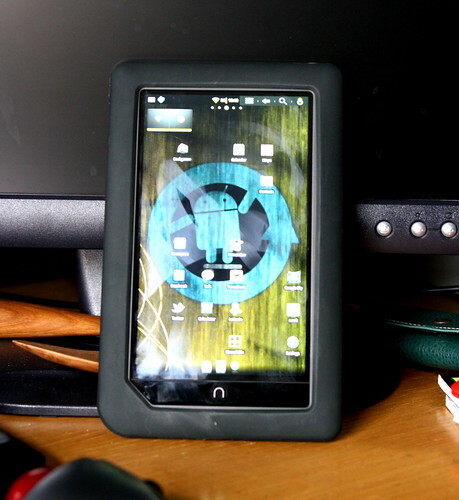 A few days ago, he came home with a brand new Nook Color, which he had already rooted and installed Cyanogen upon. It’s a very pretty toy. Two days later, he got a little unexpected spending money, and (generous guy that he is,) asked me if I might want one, too. Off we went to eat delicious Altu’s Ethiopian food, and then to Barnes and Noble. The friendly staff at B&N excited told us about all the new software updates that would be coming down the pipe… which were completely not of interest, because the new, shiny, lovely, gorgeous little tablet would have the proprietary B&N software wiped from its innards within the hour. 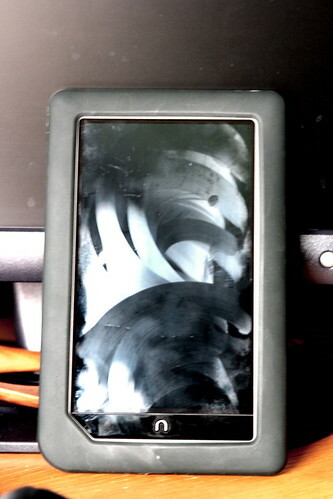 All went smashingly well, and soon I had a wonderful, relatively inexpensive, Android tablet computer. Score! 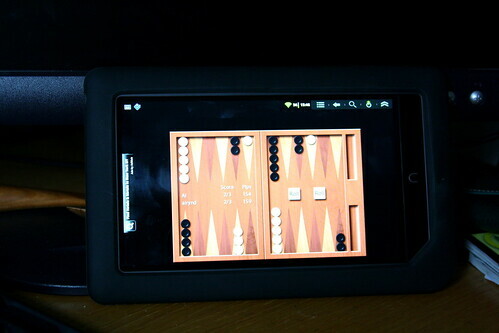 It’s so much more pleasant to read email, surf the web, check my calendar and, um, play a whole damn lot of backgammon, on a the nice, large screen (large compared to the Droid screen, anyhow.) The nice, large screen does like to collect nice, large amounts of fingerprints, but this doesn’t bother me too much. Please forgive the crud all over my lens here. It makes Tribble purring noises. Adorable, soothing, awesome. He’s got things all hooked up so the devices will even back themselves up via cron and an rsync script nightly. Neat! The one thing I haven’t tried to do with it yet is reading a book; we have to do some kind of tomfoolery with the micro SD card to get the Nook app to play well with Cynogen. Still, I reckon the black and white nook will remain the primary reading device, and this will be more of a toy/utility tablet. It’s a little bit scary, how easy it is to transfer accounts and software onto the new tablet. Well, not so much “scary” as “totally freaking awesome.” Click stuff on desktop, apps magically appear on tablet. NIFTY. Back everything, including apps, up to Google? Don’t mind if we do! Thanks, MegaConglomerate, Inc!